MoneyConf in Dublin is now the fastest-growing FinTech event in Europe, Web Summit co-founder and CEO Paddy Cosgrave revealed yesterday. He confirmed growth of nearly 3x year on year and that there currently are 4,903 registered attendees for MoneyConf 2018. Last year MoneyConf in Madrid attracted 1,868 attendees. MoneyConf started in 2015 and is Web Summit’s FinTech event bringing 5,000 of the world’s leading FinTech and banking founders, CEOs, investors to Dublin. Speakers will include the founders and CEOs of the world’s largest FinTech companies and global banks as well as cryptocurrency leaders and major financial investors and global media. 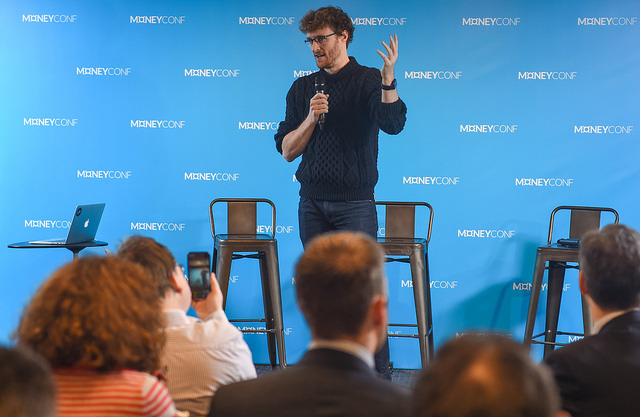 MoneyConf grows nearly 3X year on year, Paddy Cosgrave, CEO of Web Summit, announced today. The 5,000+ attendees will have an estimated economic impact of 22.7 million euros to Dublin. Web Summit is creating 50 new jobs amid a rapid international expansion with two new offices and hiring across eight cities. Web Summit announces new measure to help employees with mortgage costs amid worsening housing crisis. “We expect MoneyConf in Dublin will have over 5,000 registered attendees. It’s great to be back. We said we wanted to move MoneyConf to grow the event and now I can tell you that is what we have achieved. MoneyConf is the fastest-growing FinTech event in Europe. I am very proud to run this event in Web Summit’s home city,” Paddy Cosgrave said. The unprecedented speaker line-up includes the leaders of eight FinTech unicorns: Stripe, founded by Irish brothers Patrick and John Collison, as well as Transferwise, Revolut PolicyBazaar, Credit Karma, Klarna, Avant and Kabbage. There are two new conferences within MoneyConf: eXchange covering payments and CryptoConf covering cryptocurrencies and blockchain. Paddy Cosgrave also announced 50 new jobs at Web Summit amid a rapid international expansion of the company. Web Summit is opening an office in Toronto after the move of its North American event Collision to the city and another office in Hong Kong. It is also looking to hire in eight other cities including Singapore, Amsterdam, Berlin, Dusseldorf, Lisbon, London, San Francisco and New York. To combat the effects of the housing crisis, Web Summit has launched a new measure extending help with accommodation costs for those renting or with mortgages within 2km of the company’s Dartry headquarters. “Web Summit employees are struggling to find accommodation in Dublin, so much so house and rental prices are a significant factor in hiring conversations. This is a small measure to help address the problem. But if we have this issue as we rapidly grow the business, imagine what it is like for thousands of other companies,” added Cosgrave. – Sarah Friar, CFO, Square – Jack Dorsey’s Square has recently been called ‘Amazon or Google in their early days’ by analysts and Tyrone native, Sarah, successfully led Square’s IPO in 2015. – Valentin Stalf, Founder & CEO, N26 – TechCrunch calls them “ a bank designed for the 21st Century” and they’re not wrong. The mobile bank Number26, founded by Valentin Stalf and back by Peter Thiel, is competing with traditional branch-based retail banks by offering a suite of mobile banking services that customers can use entirely from their smartphones. They are signing up 2,000 new customers a day and plan to acquire 5 to 10 percent of established bank customers. – David Chaum, Cryptographer – David Chaum who WIRED calls “ The Father of online anonymity” is a cryptographer and inventor of e-cash which allows people to use virtual money, stored on their computer, to make purchases and send money to other people. – Kristo Kaarmann, CEO, TransferWise – Kristo Karmann is co-founder and CEO of Transferwise, one of Britain’s few tech unicorns who Forbes say are “shaking up the world of international finance”. The company is a loud opponent of Brexit and are using technology to make it faster and cheaper for users to send money abroad.